Ok. So it is Tell without Show time. Next week, I will get some pics uploaded to the new photo server. edit: pics now added. scroll on down! But, for now a beginning. At about 1 PM today the truck from the North Country arrived with my JD350C. So, I am now back to having a 350. Ever since we bought this place in 2004, I have regretted not moving my 1968 Straight 350 down to NC from NY in 1997. OK, that is finally fixed thanks to Mark, aka pondhogvt, who found a really nice one. And, then made it nicer by spending some quality time with it in his workshop. And, taking even more time to take a pile-o-pics and email me seemingly every day telling me what he found as he went along. Lots more to come, but I just got done working with it and really (really, really) need a shower. Last edited by Stan Disbrow on Sun May 06, 2018 1:51 pm, edited 1 time in total. So, let's see the first pic. This was it up at Mark's place in VT. He had dropped the blade outside and pulled the crawler inside to go over it. And, then he didn't like the way it looked and so got loose with some paint. Now the crawler looks grand and I have to get loose with some paint on the blade and frame. Edit: OK. First try worked, except I managed to copy the thumbnail and not the full sized pic. Duh! Easily fixed, though. Here it is finally at my place. We used a hauler who needed some load to head from the North Country to Florida. The main business is hauling Snowbird cars and such back North. So a few weeks waiting, and it got here on the cheap. One issue: the driver found that someone used his nice beavertail trailer with movable ramps and left him with one with fixed width ramps. Too wide for the 350C. So, I had to have a way to get it off. I made a stone ramp with my 5103 wheel tractor and loader and off the 350C came. Hence the 350 in my driveway and a ramp-like pile of crush and run. 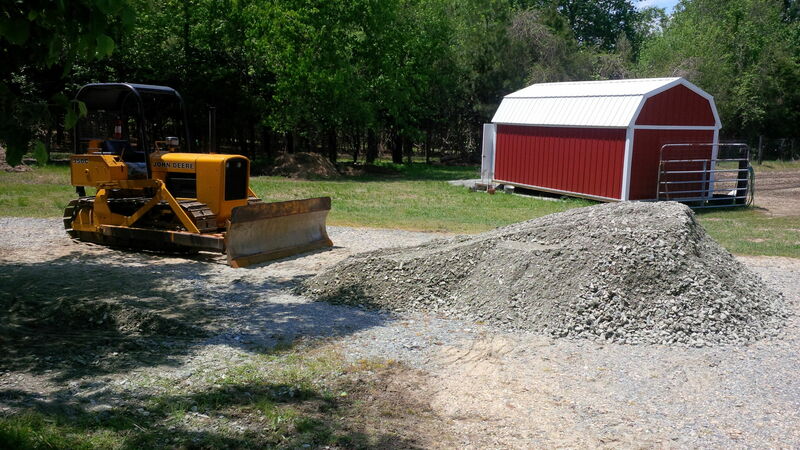 So, the pile got there by tractor/loader. It wound up pushed back where it belonged with the 350C. Of course it did! I just could not wait to push something with it! So, here is its new home. 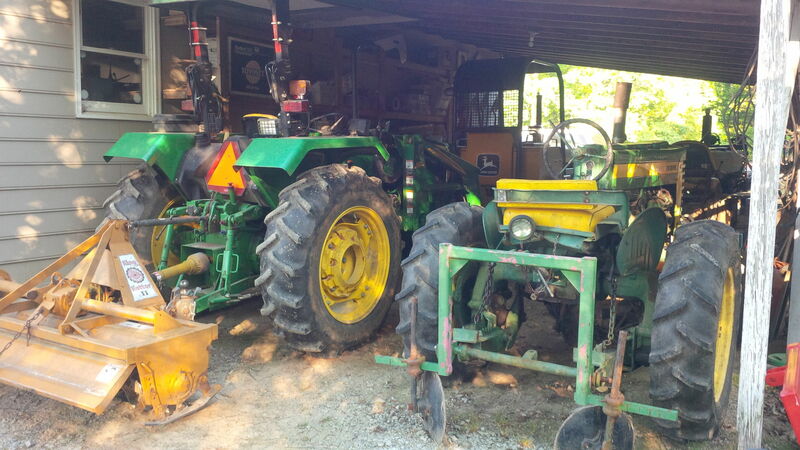 Stuffed under my tractor shed alongside the 420c. And, just to show how packed it is, this is the other end with the 5103 and my Garden Tractor, the venerable old M. The 5103 has to go in with the bucket off the loader frame and the frame all the way down. I have just enough room to walk between the front of the 5103 and the back of the 350. There is more space between the M and the 420 and that is where I keep the fuel cans. As you can see, it is planting time. Rototiller on the 5103 and disc hillers on the M.
Can the wheel tractors get in the shed from the back or do you have to move the crawlers every time you want a tractor? I guess you measured and It won't work with crawlers in one row and tractors in one row? that sure looks purtty setting there!!!! Time for a new shed! Tractors back out and drive in, crawlers drive out and back in. So, I can use any given one without disturbing the others. The new stuff has to clear the roof with their ROPS so they have to be where they are. The old stuff can be under the low side of the roof since they have no ROPS. I think about a new shed roof off the back side of the garage, but ya gotta admit these do fit. It is kinda cozy! Sorta like the way race trailers are stuffed. 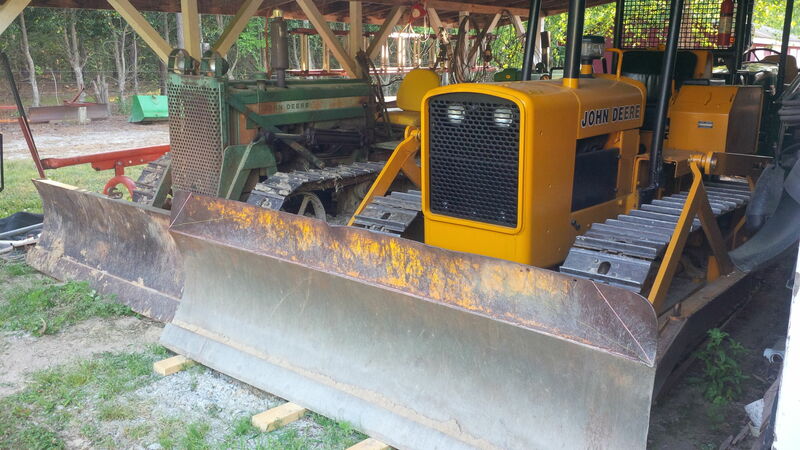 Plus, there is a fifth little guy, an x495 diesel riding mower, which is inside my garage. Now, I have to decide what to do with the 420c. I have taken it to old iron shows, but it gets little attention. This area was not one for crawlers, so it doesn't spark memories. It mainly causes confusion. I get asked who made the conversion of a wheel tractor..... And, I won't be doing much work with it now. I have read about your family's original crawler. It was nice to see pics of it. It presents nicely in the pics, nicest original I have seen in quite a while. I had 2 420C for quite a few years one was a outside mount ATECO blade, 5 spd, reverser, 5 roller with a complete 3 point(bought this when I was 16)and the other was its twin but with a loader and sans 3 point(came from Lavoy's family). 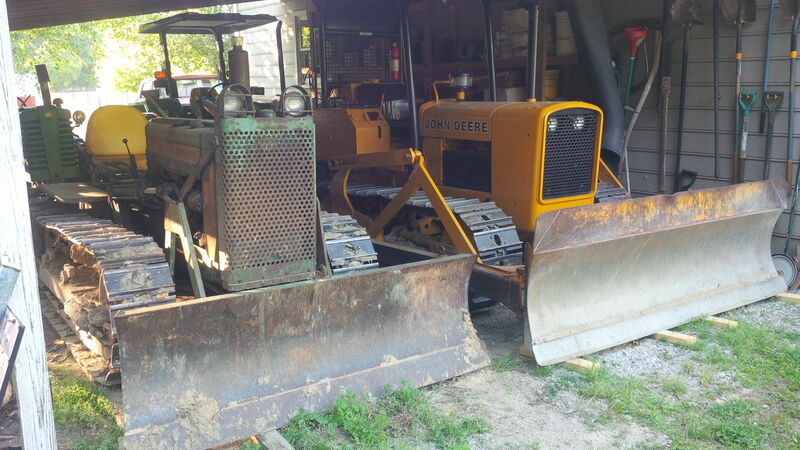 I sold both to fund a pair of 450C track loaders. Occasionally I miss the little 2 cyl, but I sold them at the near peak of the 2 cyl craze. And setting on the 450C makes me forgot pretty quickly. I have several 2 cyl row crop tractor to satisfy the 2 cyl crave. I had a series of pics of the 420 on here in another thread. Gone now that the Photobucket thing happened. I still have those shots on a secondary hard drive and ought to dig up that other thread and replace the links to ones on our new server. Something for another rainy afternoon. Well, the pics are still on PB, and they can still be seen if one copies the link for each in the thread into a new browser tab. That, of course, is a Royal PIA. Yeah. Next rainy day. Edit: and, I did put those pics onto our server and changed the links in the other thread. In my case, when Dad took the 420 with him when he retired, I got a straight 350 with outside blade. I liked it better. But, when I moved from NY to NC, I let my uncle have it. We then traded the 350 for a 1520. I could move the 1520 myself and the 350 was too heavy. Plus, I could sell the 1520 in NC for more than I could sell the 350 for in NY. Later on, when we moved to this little farm, I really wished I had kept the 350. By then, Dad had passed and I had the 420, so I wasn't rushed to get another 350. In the end, I have one which is much better. I never really got caught up in the 2-cyl club. I have had a few, with the M and the 420c being around the longest. I have always been more of a 3-cyl fan, especially of the diesel. I got hooked on a little 820 for haying back in the early 1970s. Before that it was haying with 2-cyl 420 gas and 435 diesel tractors. I liked the 435 as it had better power, but that little 820 was so much smoother running. So, when I was pleased as punch with a 350. Anyway, the 420 is all original, and everything works except the rear light an rear light socket. The wiring back there has become old and cracked. It is a late one, Phase 3, and so has the differential style reverser on it. The fender brackets started cracking so Dad welded reinforcement onto them. So, that is pretty good for one of these old girls. Edit: Oh, and the I on the ILBD switch became intermittent so I added two new wires and a toggle switch so I didn't have to jiggle the original switch to get it to work. Last edited by Stan Disbrow on Tue May 22, 2018 6:19 am, edited 1 time in total. Stan: Congrats on your new purchase. I know you've been looking for a while. I broke ranks last fall and bought a 95xt Case skid steer with chains, belly weight, bucket with removable digging teeth, and forks. Compliments my 420 nicely. The crawler works really well in the woods, the skid steer not as well, but it lifts and carries all day long in the right environment. Question, did Mark upgrade the reverser while making your 350 so nice and spiffy? It is OK. Not everything needs to be a Deere. Mark only had to take the 350 apart as far as the water pump. So, who knows what was done to the reverser by someone else. Probably nothing. He did change the reverser oil and filter and eyeballed inside as best as one can. It operates just fine, so it is still happy. It also has the spring style isolator, which is also still OK. I won't be using it on a daily basis so no knowing how far that will go. I use the clutch pedal so starts are smoother than just using the reverser lever. I keep that method so I won't get used to just flipping the lever by itself, which would mean death to the 420c reverser if I did that. So, I operate on the 'if it ain't broke, don't fix it' method. If I should need to deal with the isolator, I will pull the reverser and go thru it just because if I'm in that far, I may as well. Even if it isn't broke.